Ground Penetrating Radar Systems of Texas works extensively with construction companies. 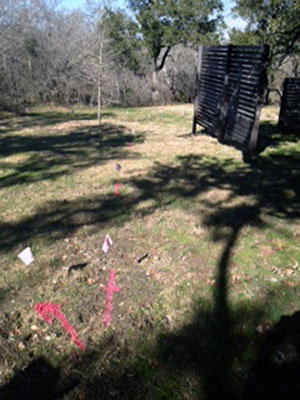 Prior to the installation of a new private fence, Brandon Campos of GPRS Texas was contacted to locate underground utilities within the proposed excavation path in San Antonio, Texas. Multiple lines were located using Ground Penetrating Radar and the Radio Detection Device. Since GPR shows data in real time, the results were communicated to the customer with the location and depths shown using spray paint and white pin flags. GPRS provides knowledge of what lies beneath the surface. Using GPRS reduces risk and cost, promotes a safe work environment, and provides non-destructive testing by locating materials such as concrete, plastic, metal, steel, and pavement. For underground utility locating in Texas: San Antonio, Eagle Pass, Laredo, Boerne, Kerrville, New Braunfels, Del Rio, Seguin, Cotulla, Uvalde, Junction, El Paso, Temple, Austin, San Marcos and Rio Grande Valley area, call (210) 607-0361 / (956) 929-0778 or email Brandon at brandon.campos@gprsinc.com.